One-stop Shopping for All of Your Office Needs! 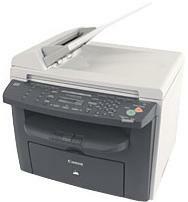 Print, Copy, Fax and Scan with the imageCLASS MF4150 Laser Multifunction from Canon. Benefit from the convenience of having the office functions you require in one reliable solution. Packed with terrific features like a 35-sheet Automatic Document Feeder, 250-sheet front-loading paper cassette and the Single Cartridge System, you no longer have to waste time in front of old, slow office machines. Load the originals in the document feeder and off they go. Your prints and copies will be made at up to a fast 21 pages-per-minute, and when faxing or PC faxing, documents will be transmitted through its Super G3 modem at up to 33.6 Kbps. Featuring Duplex Output! The imageCLASS MF4150 provides two-sided capabilities for printing, copying and receiving faxes, enabling customers to significantly reduce paper consumption. Simply use the 35-sheet automatic document feeder (ADF) or letter sized platen glass to print on both sides of a single sheet of paper. This compact desktop design also incorporates Canon's Single Cartridge System"The easy-to-replace cartridge that simplifies maintenance by combining the toner, drum and other moving parts into one unit resulting in excellent image quality retention and eliminating the complication of purchasing or storing separate toner and drum consumables. When scanning documents, you will achieve remarkable tone-on-tone clarity with color scanning up to an enhanced resolution of 9600 dpi. Overall, your imageCLASS MF4150 will complete projects quicker with the USB 2.0 Hi-Speed interface. The imageCLASS MF4150 will assist you with your business needs, and if sharing its productivity is a requirement, an optional print server is available.